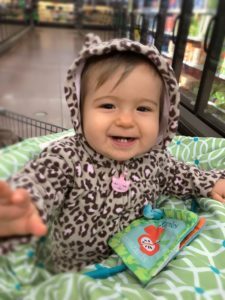 Taking a toddler or baby out into the world is not always an easy task. You never know what could happen. Usually getting out of the house is a chore in and of itself. If you have tried putting shoes on a toddler, then you probably get it. And then, there is always a blow-out or an, “I have to go potty” right before heading out the door. This usually occurs once the said shoes are already on the feet. Then, once we are out, one moment I could have perfect angels, and the next, one of the kids could be wallowing on the floor or licking the table. But, with three little ones, we have found some pretty neat products which have helped us with these intimidating adventures out. If you have a potty trained toddler, you will find yourself helping them use a public toilet at some point or another. If you are like me, you will find yourself getting frustrated or disgusted because either their bottom, their hands, or the back of their pants will touch the toilet. We found potty seat covers which cover the entire potty. They stick to the toilet seat so that they won’t move and they offer full coverage you guys! They cover the full seat and edges of the toilet. This means no more hands or pants touching the potty. Check out how they work here. Another option is the folding potty seat. We have also used these, and they work great! If you have a toddler like mine, you will almost never leave the house without bringing along a snack. 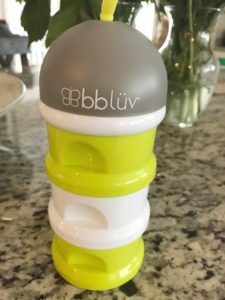 This bbluv snack container is awesome! There are three storage areas, so you can bring three different snacks. The top has a lid like the top of a bottle, so you can even store juice or water here. It’s cute, easy, and a space-saver! It’s also leak-proof and dishwasher and microwave safe. With a toddler in tow, you will have plenty to carry with you. 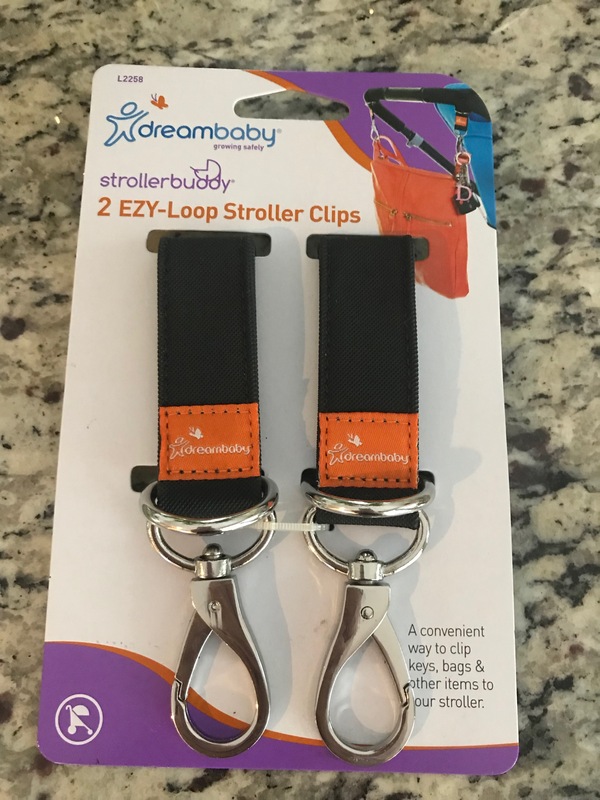 We love these dreambaby stroller clips. You can clip your purse or diaper bag directly onto the stroller. You can even clip grocery bags on your way out of the store. When we know we will be walking with the stroller quite a bit, we even clip our favorite straw sippy cups directed onto these clips. I love a good placemat at a restaurant. We all know what happens when you give a toddler a glass plate… and it’s not always pretty. Here are three of our favorites. We switch them up when we go out. The Gerber Meal Mat: This is a silicon plate with separate areas for each food item. The silicon helps it stay put on the table. The best part about this one is it comes in a container. This makes it super easy to bring back home even if it is covered in food. Click the link to see how it works. Silicone Coloring Placemat: This placemat is loads of fun. You can literally ball it up into a ball and throw it into the diaper bag and it will keep it’s shape. 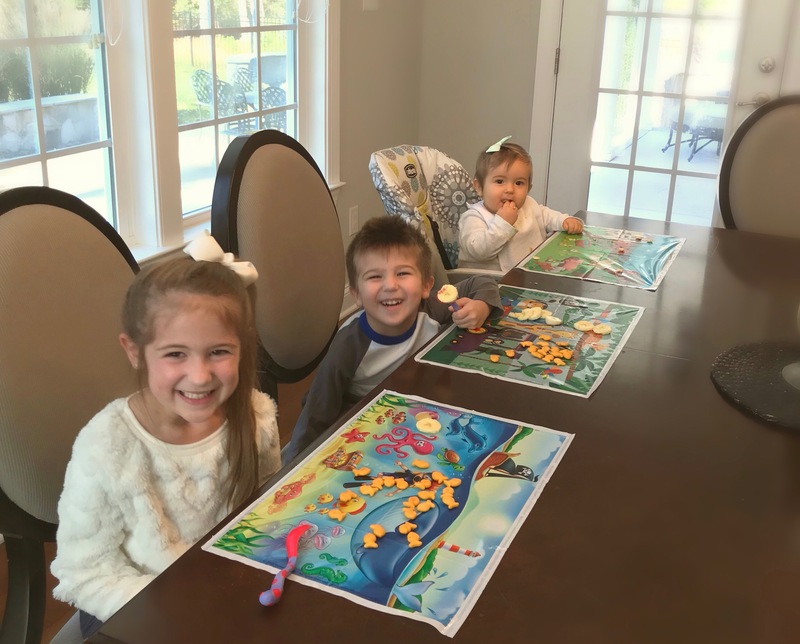 Kids can use either dry erase or regular washable markers to color it and then it can be used as a placemat when the food arrives. The best part is, it’s dishwasher safe! Klean Kids Disposable Placemats: Thanks to Home Worthy Goods for gifting us these! They are great for dining at a restaurant. Even if your toddler decides to lick the table, it’s clean. We ball these up and throw them away after, which means leaving less of a mess for the server. Double win! The kids will likely need something to do to keep them busy at some point during the outing. We especially like to bring along activities when we are eating at a restaurant. Wipe clean books can be used over and over again and they never seem to get old. Both dry erase markers and dry erase crayons work on these books. You can also find wipe clean activity cards. 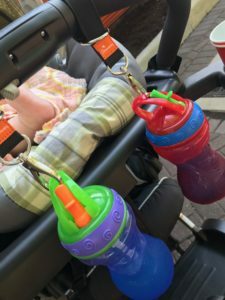 The sippy cup strap is essential for my toddlers, because I am pretty sure their drink spends more time on the floor than on the table. What is it with a young toddlers desire to drop things to the floor? At least with the sippy cup strap, it will not actually hit the floor. Yay for less germs! This one is our favorite because it can easily adjust to fit around toys. Along the same lines, if you have a pacifier lover, the pacifier clip is essential. 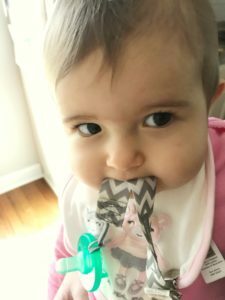 One pacifier in reach equals a much happier baby. There are so many options, but here is a simple one we like to use. We love these shopping cart covers because they can be used to cover both the highchair at a restaurant and the shopping cart in the store. I am all for items which serve multiple purposes. I swear the first thing my toddlers want to do is bite the cart. With the cover, it’s one less thing I need to worry about. 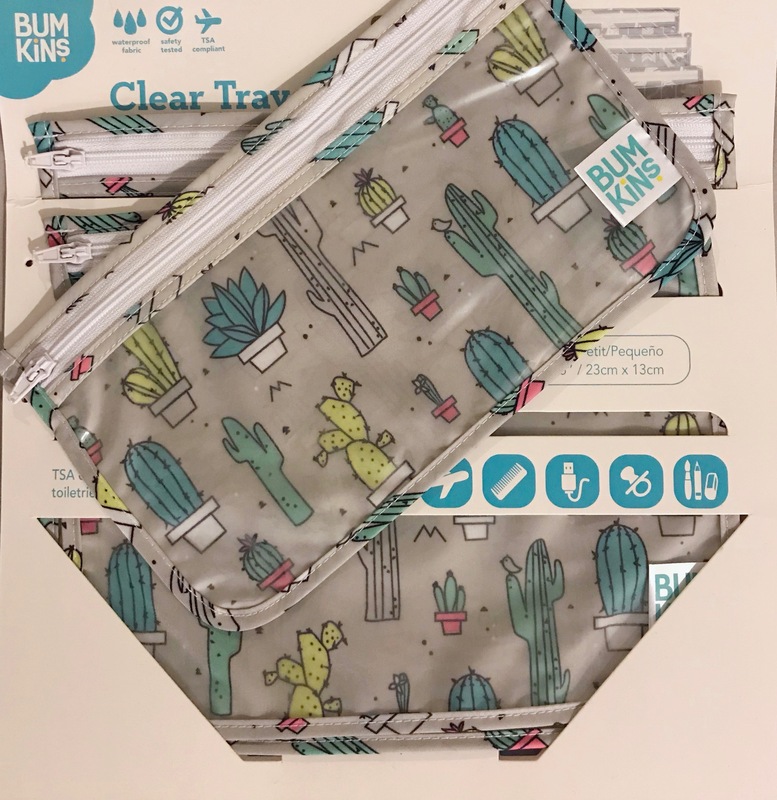 These Bumkins bags are great. I love that they are reusable and waterproof. 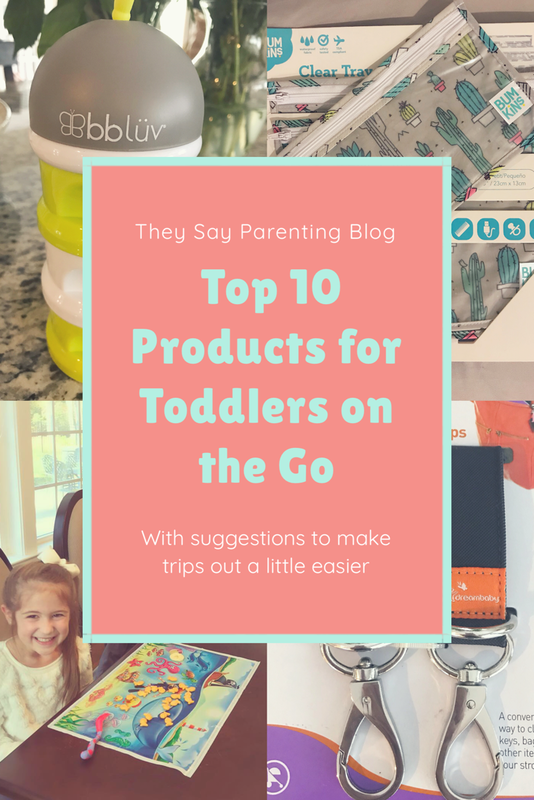 It’s a great place to store pacifiers, teethers, crayons or markers for the kids, and pretty much any small item you don’t want lost in the diaper bag. This package comes with three different sizes. These are also TSA compliant which is great for plane rides. Finally, the baby always poops at a restaurant or while out and about. And why are these always the blowouts? These Munchkin disposable diaper bags are great because I hate leaving a smelly diaper behind in a bathroom. I mean, no one wants to smell that. Seriously! I just toss the diaper inside one of these, tie it up and throw it in the trash. These are also nice for those blowouts, because once the shirt and pants are covered in poo, there are pretty hard to carry home. So, we just stick the soiled clothes right in a bag, tie it up, and take them home. 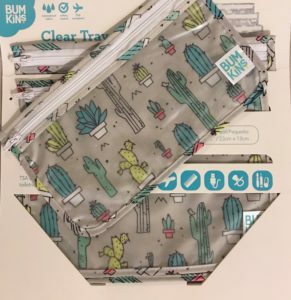 I hope these items will help make your next outing a bit easier! Let me know what you think in the comments! Such great products! Thanks for the resource! Hi Amanda! Thank you so much! I am so glad you found it helpful! Always got to have the snacks! Hi Erin! I know, right?! Snacks are everything!! Love it! Great ideas – especially for the upcoming cold season. Cart Covers are a must! Hi Clarissa! Thank you so much! I agree, we love our cart cover! Not only does it help with germs, but it is also so much more comfy! I can’t believe how the baby products have changed since I had kids. I thought I had cool stuff, but this is amazing. Hi Julie! I swear there is always new stuff coming out! It is very neat. So much has changed even since my 5 year old was born… and I feel like that was… yesterday? Thank you so much Corinna! The toilet seat cover is an absolute must! We never leave home without it! Hi Alanda! I am SO with you on this one! I was so happy I came across this item! This list is so spot on! Also, those snack cups look amazing! Ours are definitely not that cool. I may have to give those a try! Hi Calista! Thank you so much! That means the world! I really love the snack cup! Really space efficient, and a plus: three compartments for three kids! 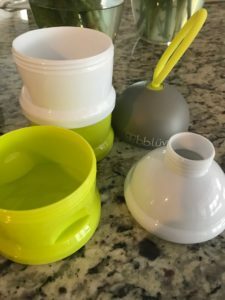 These are great items, that snack cup looks great. 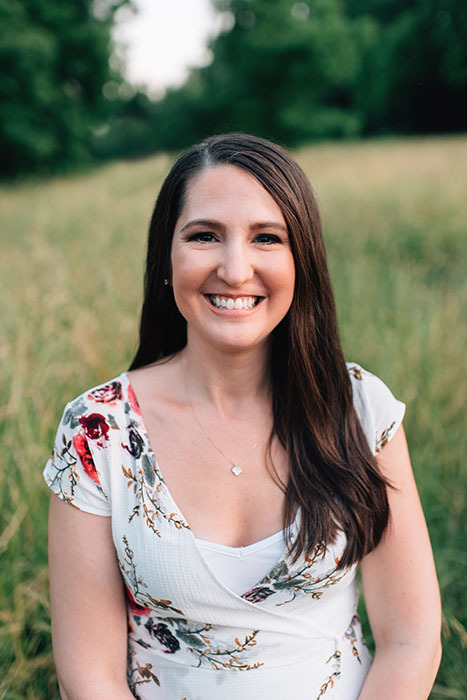 There are so many great products to help moms. Hi Jessica! Thank you so much! I truly appreciate it! I love the snack cup too. So far, I have used it for the kiddos, but I am thinking I could even find use for it myself! Hi Angie! I totally know how that goes! Sounds like we can relate! I do hope these items will be helpful for you! These days, I will take all the help I can get! Great products! I have never used a cart cover though. I’d rather just let their immune system handle things. Hi Cindy! Thank you so much! You know, that is a great point! I go back and forth on that. A strong immune system never hurts! I used those stroller clips all the time! They were so handy! Hi Tara! I agree! I am so glad you enjoyed them as well! Thank you! Hi Lana! Thank you so much! I truly appreciate your nomination! It means the world to me. I will have a look for sure!